The process of making a colored poinsettia is interesting. Growers start with a plant with light colored (white or pink) bracts. You’re probably aware that the colored parts of a poinsettia are not true leaves – they are modified leaves, called bracts, that serve to attract insects to the tiny yellow flowers at the tip of each branch. 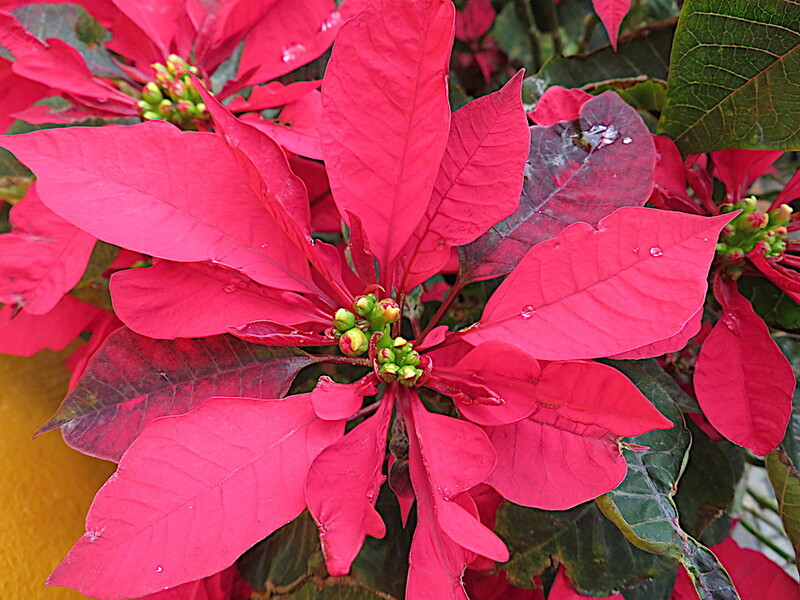 Special dyes are sprayed onto the bracts a few days before the poinsettias are shipped to the retailer. Glitter may be applied as well. A spotted effect is achieved by sprinkling alcohol onto the dyed bracts. Dyes are available in many colors, so plants can be dyed to match indoor decor or even your college football team colors! Poinsettia bracts will naturally fall from the plant as it ages this spring. If you keep your plant alive it will produce bracts with the “natural” light color the plant had originally. This entry was posted in Flowers, flowers of Mexico, images of flowers, Mexican Flowers, Uncategorized and tagged coloration in poinsettias, flowers, FOTD, poinsettia images, Poinsettias on December 10, 2018 by lifelessons. I give up. Every time I try to put captions or to even put titles under the photos, WP won’t accept them and erase the photos. Once again, the Update and Save buttons have disappeared and their automatic update feature doesn’t go into effect. Both of these photos are my own, as are all photos on my blog unless I state otherwise. I hope they get these frustrating changes finished soon. It’s taking me longer to post now than to write my pieces and do the photographs. Did you get my email/screenshot?? I sent it early AM Sunday your time to Jubob… In spam maybe? I’ll look for it. Actually, my blog magically reverted to ordinary today. I had written several comments and emails to the happiness engineers, who never answered, but perhaps some kind soul switched me back? Or perhaps they decided to give me a sample since I never signed over. At any rate crossed fingers that it will remain, although it still switches off and on re/ letting me set up a gallery and letting me choose the photo size. One post it will allow it. The other, not. I think WP has gone bipolar. And no, no email from you. hahahaha! maybe it was “Manic Monday’?? Every time i open the ‘old’ editor (not the Old, old editor – I can access 3 now, any time i chose and can switch between them in a single post if i have too?) i get a bar at the bottom and a special box at the base of the settings letting me know the ‘New’ editor (Gutenberg) is coming and i can try a sample if i wish to. I tried it once and did not like it ( even though i managed to figure out most of it eventually) because it does not have the option of copying an old post with tags and categories for my ‘regular’ FOTD posts and such. I’ve never had it ‘go rogue’ on me though – it has always ( so far) let me do what i want! Do you know if it could be partly due to Apple (or Microsoft?) software upgrades at all?) – I use Win 7 and most things seem to stay ‘stable’ for me. Forgottenman put a “contact me privately” option at top of my blog but so far it doesn’t work. Getting our ducks in a row. I got that bar, also, but never clicked on it for fear of not being able to get back from Neverneverland. Marilyn had such horror stories about it. Where is the place to switch between the three? I think they are just randomly switching me back and forth. I mainly notice the difference because one gives me the option of picture size and whether to create a gallery and the other doesn’t. OK – now i’m losing the track a little here? I just checked an v1 has an option when adding media of ‘create gallery’ you have to click on and then you can add the pics while in V2 you select your pics first and if you choose more than one it gives you several ways you can add them to your post including as single pics or as a slideshow? When i sign into WP ver 2 comes up automatically when i hit the ‘Write button in the top menu bar, and to get to V1 ( with ‘create gallery’) i have to select the ‘My Site(s)’ drop down tag, go all the way to the bottom and choose ‘WP Admin’ then i can choose “Posts – All Posts and select a post for editing or choose to open a new edit. You absolutely do. They do these new versions without preparing us. I have no idea why sometimes they let me edit in one and switch me to another at other times. I like to stay in V1 the whole way. No option lets you do this? I guess perhaps it is something I do between the time I write my poem and the time I add photos. And I’ve found at least the other day that minutes pass before they do the autosave. At that time there was absolutely no save or update button at that stage. I think they do what I sometimes do and that is that they fiddle with something as you are using it. (I do this in editing after publishing, I mean.) Perhaps this screws things up. I found that the reason everything was distorted was because something was altering the format of the edit screen so my writing was scrunched to the far left, narrow and tiny and the notifications (comments) and tab selection and were scrunched way to the right–tiny and overlapping, with a huge white space in between that took up 2/3 of the space. It was so maddening. When I finally published it looked okay, but hard for trying to write a poem and read comments. After days of this I found it was as simple as hitting command + several times and everything went back to normal. Such a relief. Now it is not a problem. The page remains the size I want it to. I’ll have to read your instructions again as I think you tell me exactly what I need to know. Do your blog and I’ll reblog and tell others to and we can share the word. I don’t see anyone but me complaining now so perhaps we are the only ones with problems right now? In the past many people were having problems but they don’t squawk as loudly as I do. In Honolulu, there is a roadside stand of poinsettias. As they begin to ‘bloom,’ they are covered with cloth to keep the sun off them. About 2 weeks before Christmas (or before color is desired), the cover is removed, and the green leaves turn bright red. You were quite right about Cee’s ‘poinsettia’ yesterday – No male and female bits and rounded ends to the leaves(bracts) meant it wasn’t… took me a quite a while to find out what it was though!? you are so good at this sleuthery. These days i bet Private AI could do it faster and cheaper. Who is Private Al? Aren’t you Private Bob? Private A I (Ayy EYE) – Artificial Intelligence! Google and Facebook are building up massive databases with algorithms that will let machines identify pictures/images and produce their own appropriate keyword definitions or captions. You post a photo of ANYTHING and they will produce the ‘correct’ description or comment on it. I hope it’s better than predictive texting!? Aha.. still having a problem distinguishing between those l’s and capital i’s. I once got my fingers on the wrong key and sent a gobbledygook message to forgottenman. He copied it and put it in Google and it automatically told him what I would have said if my fingers had been on the correct keys!! Now that is scary. And amazing. It just picked up that that was what had happened. If they don’t already, computers will know us far better than we do ourselves soon – we will effectively become redundant – and that IS scary! Those who still choose to use facebook should realise that facebooks servers can now tell when you accidentally make a ‘wrong choice’ based upon your past life history and preferences (likes) and are capable of telling if you are deliberately ‘lying’ to deceive them! Maybe the next step is to have A ‘L’ bloggers interacting with real human bloggers as if they are human so that they can learn how to take over real people’s blogs and replace ‘people’ all together? Could that be because of the language difference? Writing a foreign language. It has occurred to me that robots and computers are the next stage of evolution. If it seems impossible, look at the difference between one-cell organisms and homo sapiens!! And of course, each new stage of evolution renders many former stages extinct. I can see artificial intelligence staging a revolution and an (un) civil war. Did you get the 2(3) emails?? Sent in last hour!